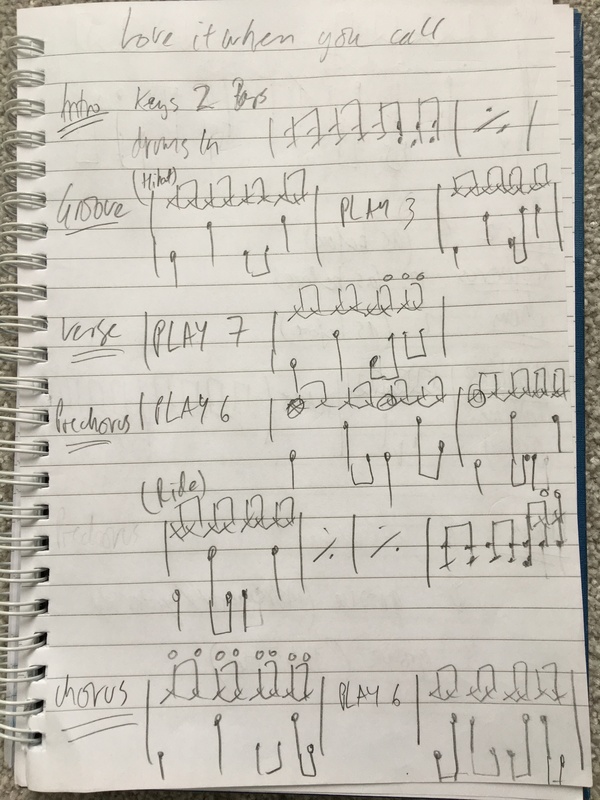 In this blog I’m going to look at how to learn a song ‘quickly’ and write out a basic drum chart. I find myself over the years having to learn many songs on the drums for all sorts of different gigs. Sometimes I have had to learn an additional 20/30 songs for just one gig. 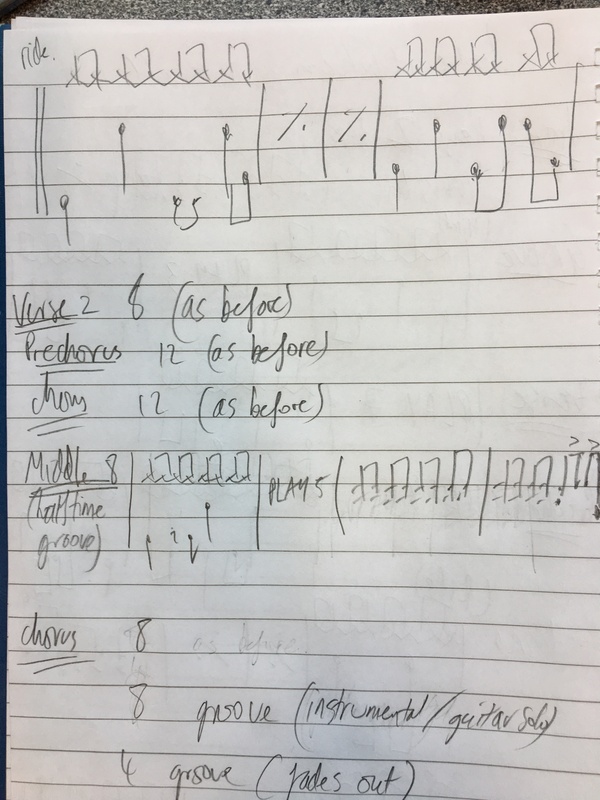 With limited practise time per day due to my teaching and performing schedule, I have to be efficient with the time I do have to make the most of it and learn to write ‘short-hand’ drum charts to help learn a particular song. There are many different aspects to consider in learning a song. If you’re not sure listen really carefully to the drums and the other instruments in the song to see if you can work out what is being played on the drums. To help understand a song ask the following questions. Is it in 8th notes or 16th notes? Is it in swung time or a straight feel? Is it triplet-based or a 12/8 feel? Does it start loud and then get softer later or vice versa? Does it have any ‘stops’ where the drums stop with the music? Are there any particular drum fills or rhythms which have to be played with the song? Is it a straight rock/pop feel or is it a little more funky or jazzy? Is there tight closed hihat or loose open hihat which is a more heavier feel? Is there a groove on the ride cymbal or crash cymbals? On another note if any of the questions above do not make sense to you please get in touch and I’ll be happy to explain this further. I have picked this track to use as an example to show you how easy it is to put a simple drum chart together. This song is a medium tempo 8th note groove pop/rock feel with a few variations of the groove and a few basic drum fills. Below are some snapshots of a very typical drum chart I would sketch out to learn a song. I purposely wanted to demonstrate this in a ‘sketch-like’ format as the idea of writing this style of chart is that it should be quick to draw and simple to follow. It is important to mention that this is NOT note for note accurate but a general guide to get you through the gig. Remember if you have another 10/20 songs to learn you don’t want to spend too long drawing up one chart. Sketch it out, practise and move on so you get ready for the show! The intro starts with a keyboard/synth riff for 2 bars but fades in on the track and then drums come in for 2 bars with a typical snare/floor tom rock unison 8th note drum fill with a crescendo. This leads into a straightforward 8th note rock groove with loose/trashy style hi-hats for 4 bars. The ‘Play 3’ means play 3 more bars of the groove. Watch out for the 2 snare notes in the groove at the end of the intro. This happens throughout the song. The verse continues with this groove for 8 bars with 3 snare notes and open hi-hats at the end of this section. The Pre-chorus in a song is section as it sounds before the chorus and will have a different feel musically to the verse. Here we have an 8 bar section with a few hits on the crash cymbals in the 7th and 8th bars. Then the feel changes again and moves on to the ride cymbal for 4 bars. This is the same feel as the intro with loose hi-hat cymbals. This is often the case, intro and chorus as the same feel. There are 8 bars with a variation in the 8th bar and then we move onto the ride cymbal for 4 bars. Watch out for the change in groove pattern. There is then a second Verse, Pre-chorus and Chorus which is the same as the first. This is a section in the middle of the song which is normally 8 bars hence the name. In this song the feel changes to a half-time groove. Be careful to keep the hi-hat notes even so that the groove does not speed up. 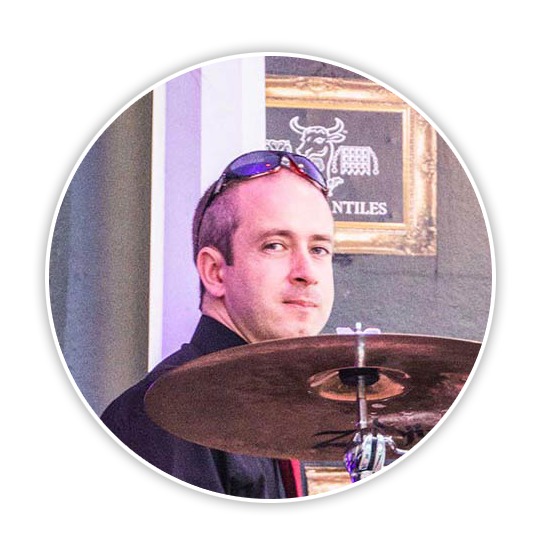 In bars 7 and 8 play the unison rock drum fill on the snare and floor tom. This is then followed by the first 8 bars of the chorus, 8 bars of an instrumental section/guitar solo and then 4 bars of the groove which fades out. So the following video is me playing along to the song in the SDS studio. More videos to come soon in future Blogs but for now….enjoy! So I hope that this has been useful to you and that you can use this technique to learn and play your favourite songs. If you have any questions please get in touch. You can email me here or why not leave a message on the SDS Facebook page, link below.